A graduate student , Tech Geek, Proud Mozillian. Being part of All Hands Hawaii ! Recently I traveled across the Pacific Ocean all the way to Hawaii to participant the coolest group of people, the Mozillians. It was the last All Hands happened during early December just before the Holiday eve. It was a whole week of Moz-awesomeness and more amazing for the participants like me who experienced it for the first time! All Hands is the bi-yearly gathering of Mozillians including contributors and Mozilla employed people to reflect on the past activities and set goals for the further. There were more than a thousand Mozillians in the resort where the event took place. What I have experienced in this All Hands is quite a bit interesting for me! I was invited by the Connected Device Team (In case you are not familiar with what this team is about, why not let’s have a look). This team is concerned of several projects and I was invited by the Sensor Web project team. Mobilizing the community and get involved with the API of Sensor Web project was my primary concern as far I can disclose (NDA!!!). The project Sensor Web is concerned and built to sense the environment and air quality around the sensor device installed at and a web interface will hold the analysed data for remote representation (Know the detailed architecture here). By the time I’m done with this article there is already Mozilla’s very own development board for Sensor Web Project. See the development board for Sensor Web project..
Back to what happened at the All Hands; I was mentored to prepare for the All Hands by Michael and at the first morning of the work week he introduced me with the rest of the team working on the project. First I met Dave and later Cindy, Jean, Dylan, Fernando and all the team member. That morning we had very inspiring plenary session. I really loved the talk about diversity and inclusion, about need for community in the growth of any technology and most attractive one was the plenary video. From the very first day there have been many specific plenary sessions, talks, teamwork sessions happening throughout the day. Hence, I could hardly go catch all the amazing ones. But I did try the Mozilla VR and A-frame demo session. The Connected Device team room was full of surprises for me. Sometimes there were parallel team pitching, sometimes amazing award session. All the teams with different project were indulged with their work throughout the week in a fun way which reminded me the Mozilla way of doing things. Meanwhile, Michael and I had fruitful conversation on our next quarter agenda on how we can contribute in Connected Device project (Sensor Web) from the community perspective. As a part of participation team, we will be coming up with updates on Sensor community involvement in this early 2017. For 2017, our goal is to get involved in hacking Sensor kit and raising awareness around targeted communities about Sensor Web Project. I will be writing up soon on hacking the newly made Mozilla Sensor board, Sensor Web web interface sensorweb.io and the API of the project. The whole week passed by through excitement and planning for the next year. Though I had very little task to do I did have felt the enthusiasm and work-amusement in the air. There were new work and agenda updates on every projects, product and strategies. The very last day ended with wrap up session reflecting the key goals for next quarter and the team was very focused on project update. That was best staying in Hilton in Hawaii. We all enjoyed traditional Luau Performance. Fireplay was heart throbbing and the late night dancing and karaoke was real fun thing to have at the very end of All Hands Hawaii. 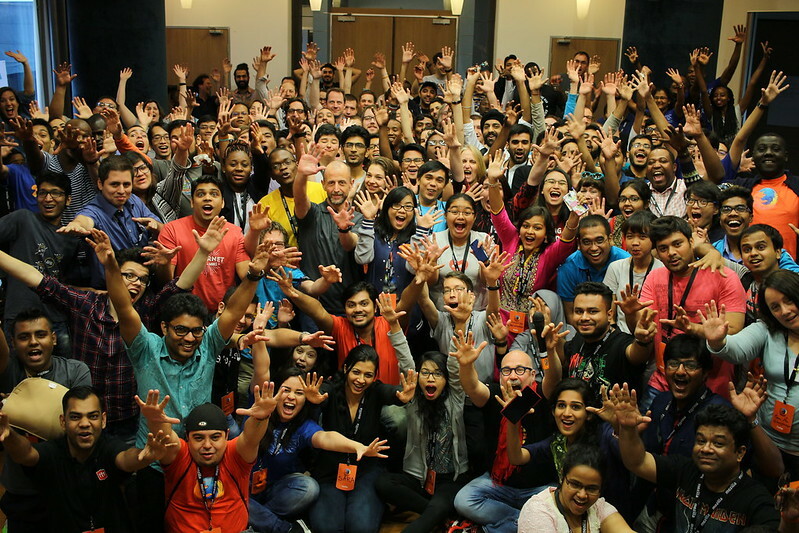 Being in this All Hands was true pleasure and motivation for a Mozillian like myself. I would suggest you read our another Mozillian Daniele’s write-up to know about different session and update. Let’s all work for the better web experience and happy contribution Mozillians! Leadership Summit, Singapore | Inspirational Perspective! Leadership? It takes many skills and devotion to have impacts on those who are led by. Last January Mozilla arranged amazing event for the global contributors and set a milestone to start a new era of the open web. I was fortunate enough to be a small part of so many awesomely inspiring people. There were leaders, there were contributors, there were amazing tech speakers and there was motivation, inspiration, enthusiasm all burning with new ideas and hands on learning with sharing skills. Was it worthy to be a milestone? Yes, In my concern it was the kick start of this year’s spirit to make a better web. There the opportunity to get involved was broad. Inspiration and motivation to approach the new development in technology that the 2 day’s Summit came up was a milestone for all of us Participated. The summit experienced the group activities from the community members who are supposed to be the core contributors of greater Mozilla Foundation. As a small part of the team, I, We had hands on learning, teaching, planning and sharing interactive sessions to experience our leadership skills more. The attendees are are recognized as the Participation Team where each of them will be rolling out as a core part of the Mozilla Leadership Network ahead this year. This event was the inspiration for us, where we planned for our next moves- for the web and for the Participation at Mozilla. We understood well that all of us need to be better, effective and active to what we do and what we care for Mozilla and the web, as a Grass-root Leader. Emerging Ideas for the next Big Move! This era is the critical time for the web as MAK say’s the saturation point, where we need to move forward for the Web and for Mozilla. The revolution has already started in the sector of Internet-of Things (IoT). To keep all the connected things open and openly connected to the web, Mozilla Introduced us with the newly designed project with Connected Device track. We had our first approach to contribute this track doing some brainstorming on the fresh idea/model for the connected devices. We take one step as a participation leader to work on that project and engage more young tech enthusiast in those project and make our project a successful one. This approach, I believe, we believe will impact on our activities since we get back to our local community. Leading the next Leaders ! Of course we need to grow our local community and engage more enthusiasts in the right direction. We had so many distinctive sessions were we groomed ourself to learn skills on taking steps as leaders. We learned how to run an amazing Hack-a-Thon, how to be a more engaging Tech Speaker while leading others to the right track. We had the track of Campus campaign focused on privacy awareness, we learned how to do coaching and mentoring when we took part in the session with Guilermo. We had learned the project that teaches the web through the philosophy of Mozilla Clubs that technically does not have any limits or CoC in teaching and spreading the knowledge of web. It does not really matter how long we have been together at the summit. All that matter is what we did and what we learned, what we had to take back to the local community. Those are the skills and knowledge to share with our local community contributors. We hop on the returning plane with new possibilities, with direction, Code of Conduct and Ideas. We developed our skills of leading and interacting with each other while we take approach for the development of the community. We came back with planning and mission for the respective local communities so that we all can work together to spread Mozilla’s mission and it’s values that it cares for. After the past weekend our mind has broaden to embrace the newest challenge in the era of IoT (participants of Connected Device track) and reshaping the greater Mozilla community (participants of Campus Campaign track) with new leadership spirit. We got back home with values, those are important in the all technological sectors from business to government, public to individuals, and Mozilla does care about them. I left Singapore feeling inspired and hopeful — both for the web and for participation at Mozilla. Yes, I’m inspired, I’m empowered and I’m skilled after having an amazing weekend back in January. That’s my Inspirational Perspective from Mozilla Leadership Summit 2016 as a Participation Leader. And I can’t wait to get started doing my jobs as a Participation Leader! This Thursday so many new faces of AIUB got to know about the contribution sneak peeks on Quality Assurance of pathway in Mozilla. The FSAs of AIUB and some pioneer QA team members of Mozilla Bangladesh (Anis, Khalid, Salman, Asif) organized and run the whole fruitful event there at the auditorium. Talking about the output was satisfactory to the organizers. The event started early in the morning with the new enthusiasts. Participants experienced elaborative sessions and digital presentation on the steps and peeks of starting from zero stage to contribute further in this pathway of testing the newest features of Firefox products. The whole program was conducted like having interactive discussions where the way Khalid delivered the presentation was pretty exciting and participant -friendly. Among most of the sessions he presented the most and was really able to catch the most attention from the participants of that event. Khalid taking his sessions presenting ways and steps of contribution in QA, Mozilla. The sessions were planned and designed as starting from introduction to Mozilla, QA contribution pathway ended with the ways of being active contributors. Intro to Mozilla, Talking about Mozilla mission. triaging and verification is the main backbone in QA platform. So, brief introduction is needed on explaining the roles of these procedures. Bugzilla is Mozilla’s major bug tracking system and how triaging and verification done will be showed and explained step-by-step. Some of the curious new Faces to Mozillian’s Team at AIUB ! new faces to involve in the FSA club and greater Mozilla missions. The organizers put an end with new possibilities of organizing a fruitful workshop with the participatory enthusiast very soon. What happened in MozCoffee Dhaka 2016 @ NewsCred ! Mozilla Bangladesh as of every year arranged the event of informal nano talks this January 26th @ NewsCred, which we, the BD mozillians call MozCoffee. The aim of such meetups is to get closer to the new enthusiasts and dig out some awesome contributors. This time the agenda was to create awareness on the contribution pathways and current campaigns running like the Privacy Week, QA contributions, newly framed FSA activities and many more. However, as a part participation leaders team I myself attended the event to share my experience to the new faces on the recent global event, Leadership Summit took place in Singapore. However, the day really was one of the well-spent one. We had awesome coffee and snacks as well. We are really looking forwards to start implementing our plans and can’t wait to share with all Mozillians that yes, we, the MozGirls rock !! !